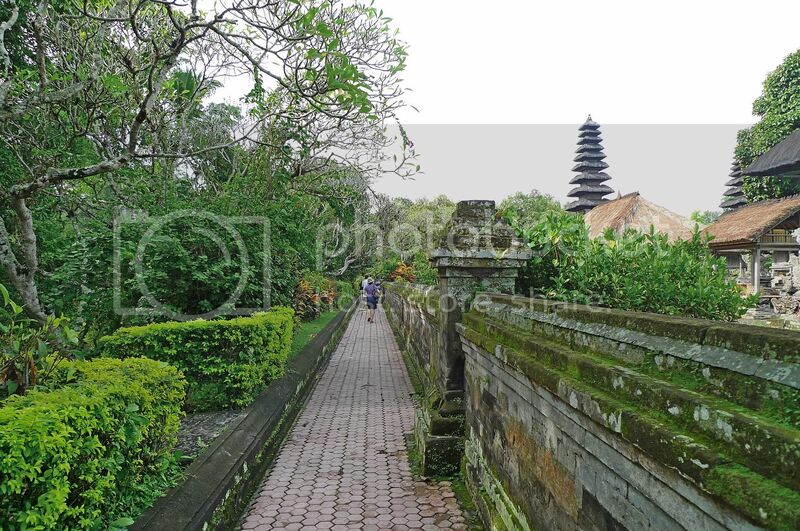 After tasting my first Nasi Padang lunch at Natrabu in Sanur, we proceeded to Pura Taman Ayun. 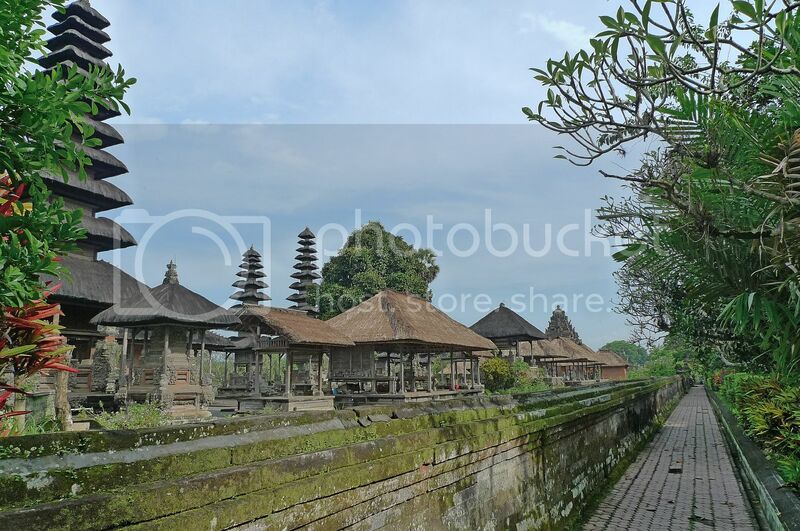 Located near the village of Mengwi about 8km southwest of Ubud and 18km northwest of Denpasar, Taman Ayun is actually made up of temples in the middle of a beautiful park. This view greeted us when we reached there. The place was surrounded by a broad river (or canal) which you see in the photo above and could only be entered from this gate-like structure. One of the stone-carved statue near the entrance. If I am not mistaken, the entrance fee was 10,000 rupiah (RM3.70). Once we got past the gate and paid for our tickets, we walked along a straight paved footpath and came across this unique looking fountain. The fountain, which was located in the middle of a small square pond, has 9 water jets. When I took this photo, the water was shooting out of the four main cardinal directions. 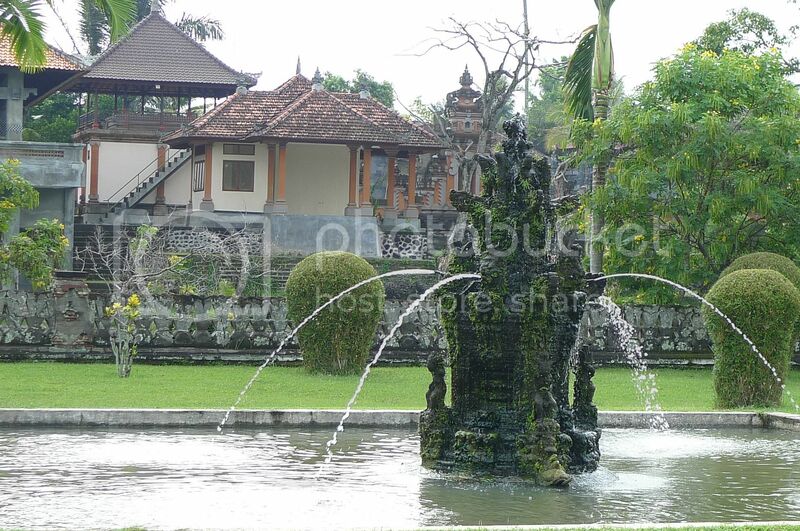 The other 4 water jets are located at the 4 sub-cardinal points and the remaining ninth is at the centre, possibly symbolizing the nine main gods of Balinese Hinduism. 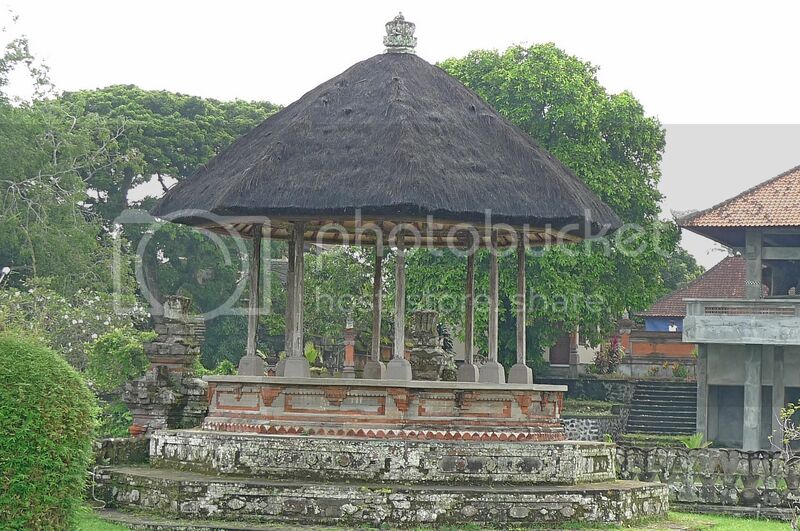 As we walked further in, I saw this gazebo-like structure and took a photo of it. Yes, it's the same structure you saw on the right side of the first photo above. Not far from here, I came across another structure. I enjoyed looking at all those intricate carvings! Quickly took another photo from a different angle. I thought the paved footpath looked beautiful as we left that structure far behind us! There were not many tourists around and we felt good having the whole park to ourselves! Haha! 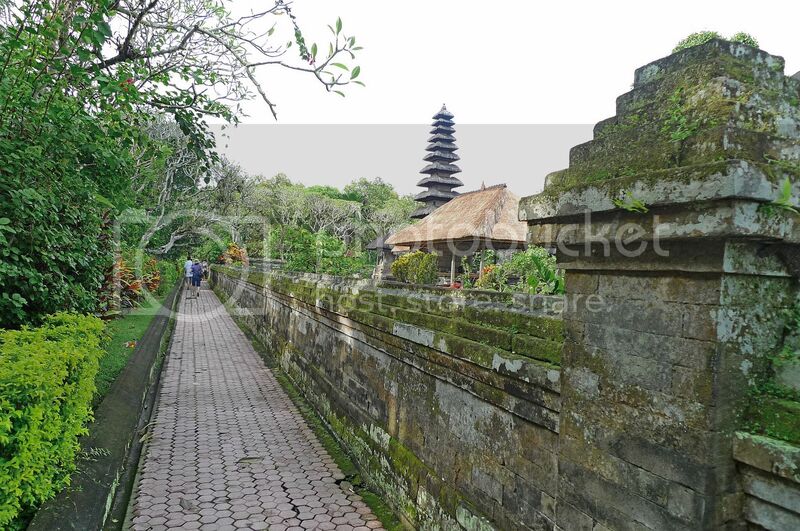 Taman Ayun literally means "Beautiful Garden" and walking here, I could not agree to it more! We soon reached the entrance gate to the main temple courtyard. We took a lot of photos of ourselves here but of course none of them would appear on this blog. LOL! 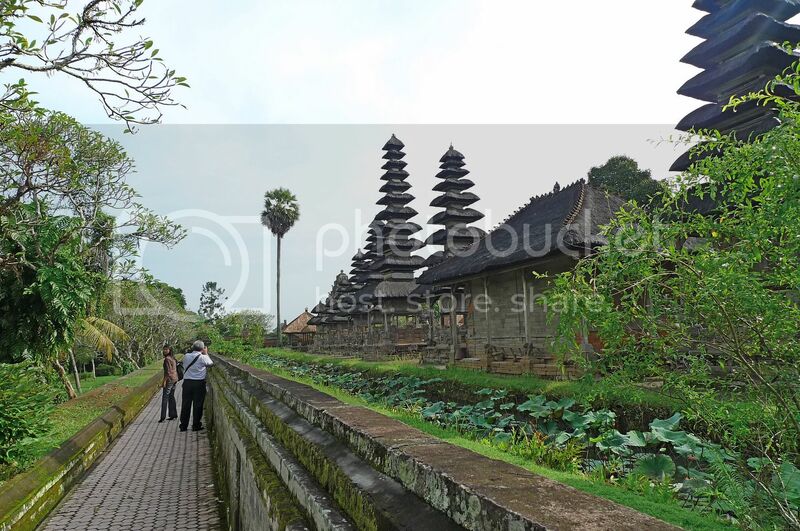 Visitors are not allowed access to this holy temple courtyard which was walled all around. It is only opened during important religious ceremonies. 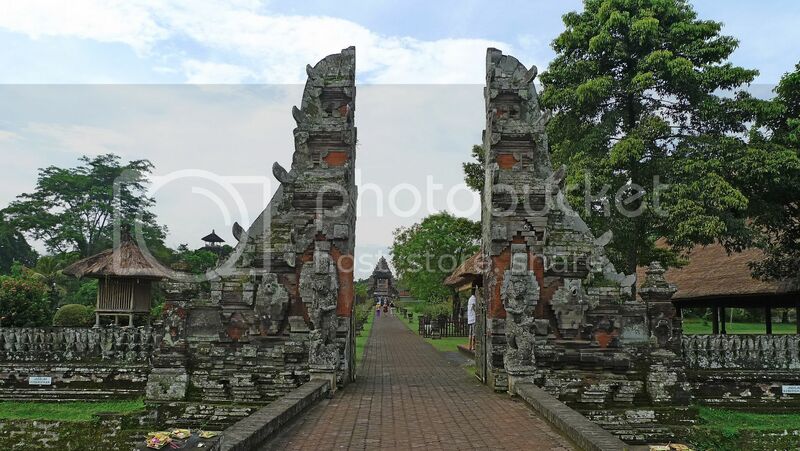 Can you see the figurines or statues at the side of this tall gate? As we were not allowed access to the temple courtyard, we could only walk outside its wall. I love walking along this pathway! I could spend a long time here if I wanted! From the photo below, the temple courtyard was on the right side bordered by a wall almost as tall as me. 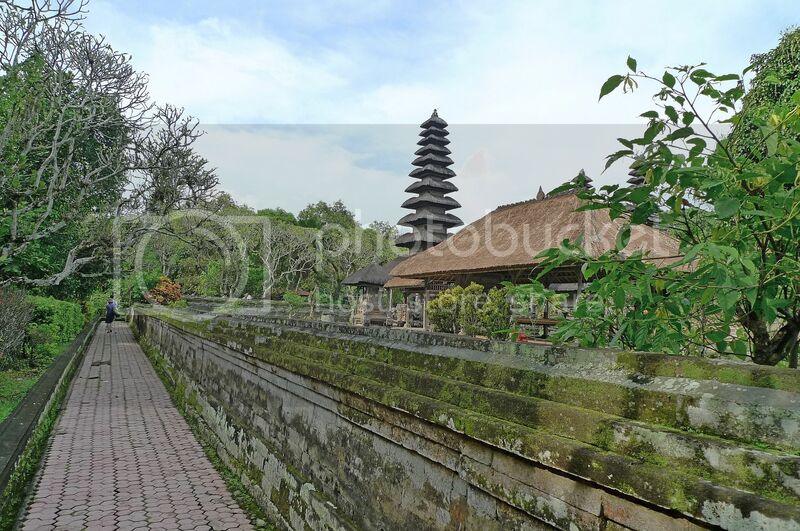 Do you see that tall pagoda-like structure unique to Bali in the distance? 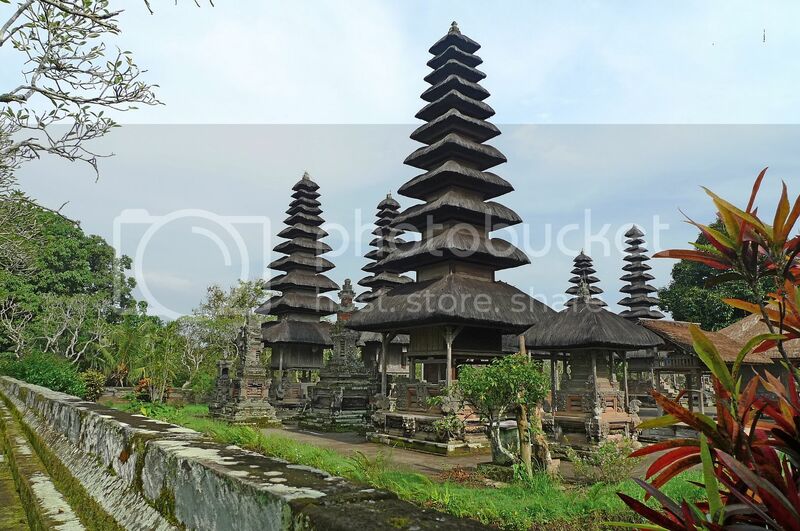 That's the layered tower found in many places in Bali! It's actually a multi-roofed shrine called meru. I quickened my pace as I was excited to see this meru up close!! And then I reached this spot and I just stopped there as I was in awe! There were lots of merus here! Finally I got to see them with my own eyes instead of pictures in travel brochures or books! Can you count how many tiered roofs were on these beautiful merus? Looking at these amazing structures made me keen to find out the history behind them. 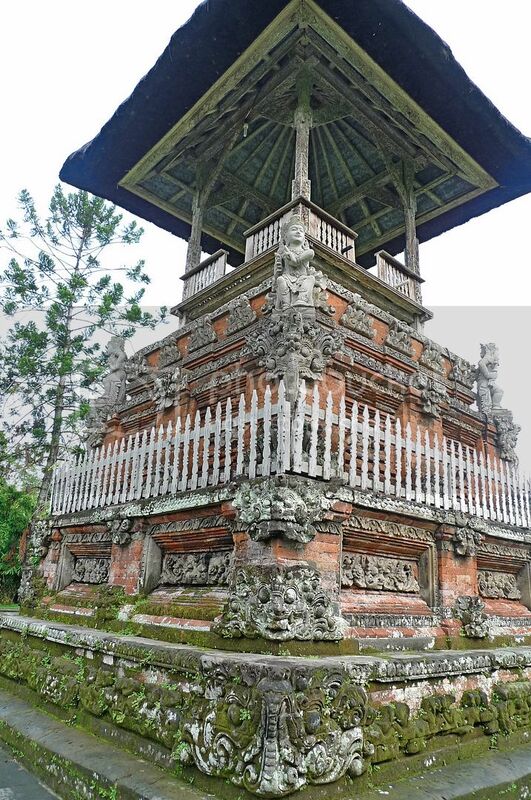 I learnt that Pura Taman Ayun was originally built in 1634 by the King of Mengwi, I Gusti Agung Putu. 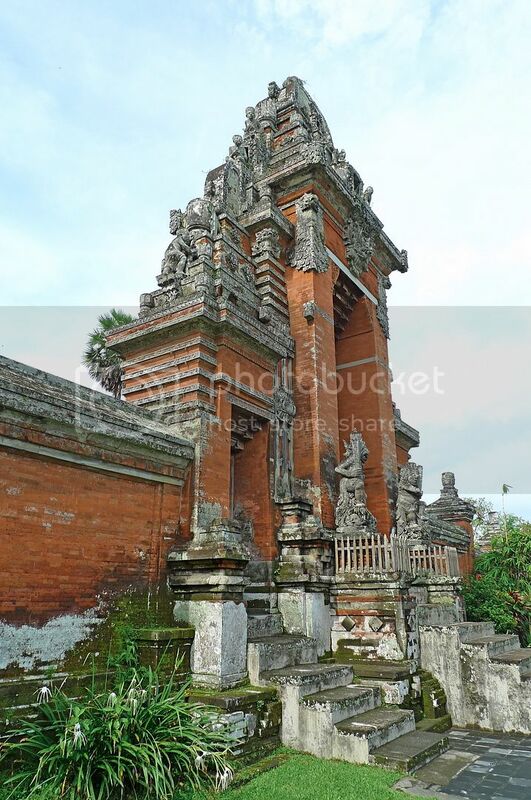 Temples were built to honour deified ancestors of the Raja Dynasty of Mengwi and other important gods. The Mengwi Kings used Taman Ayun as burial grounds, and later merus were built on top of their graves and became temples. I counted the number of tiered roofs and found some merus had only five or seven tiered roofs, whereas the taller ones had nine or eleven! After spending about an hour at the park, we left. 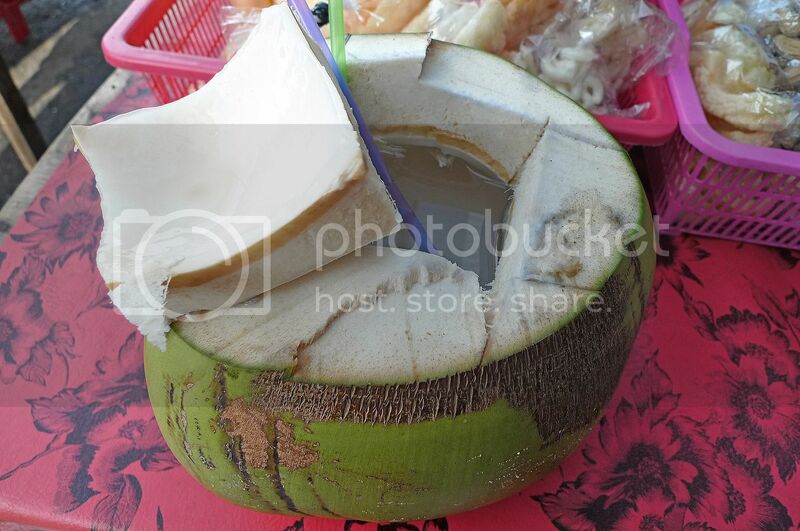 I was thirsty and as soon as we exited the park, I quickly bought a coconut drink from a stall across the road. Look! The coconut was huge!! I had a hard time finishing it all by myself! What an interesting afternoon at Pura Taman Ayun! Before we left, I took one last shot of the beautiful view that first greeted us when we arrived earlier. Coming up next : Why I Must Visit Tanah Lot A Second Time!! OMG! D STONE CARVED VERY NICE!!! Wowie caught me by surprised a new post a day after did not expect a new post this morning. Oh the merus on top of the burial ground. Is it out of bound not supposed to go in or near any of them. No 'showroom' kind of display for tourist? Oh gosh! Sorry was trying out what the heck it that round water container. 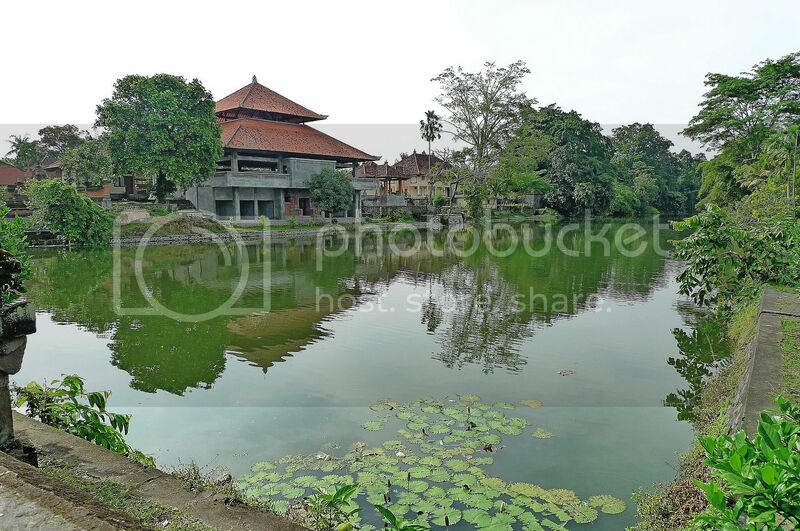 First glance thought was a toilet bowl or a bucket of water to wash legs before entering temples. Mighty HUGE c-o-c-o-n-u-t safely say bigger than the size of basketball? Shake head at Caroline.. with her existence.. no one else can get FC! The water fountain is nice... the whole place is nice.. so that thing is called meru? NOW i know..
We also have "Meru" in Klang haha..learn something new today. Nice fountain. Guess number 9 is also a very popular spiritual number in Hinduism. Thanks for sharing. Great place to visit. @Merryn: ROFLMAO! im lucky ny ma just now. open my blogger and saw his update, then click lor, but i read 1st one lar, lol. :p no i mean i read halfway n commented n back to the story again. next time i chop for u lar if im lucky again. hahaha! [Merryn] tambah minyak gambate..yes believe you can!!! Eh [Caroline] can 'chop' on behalf one kah? hahaha. 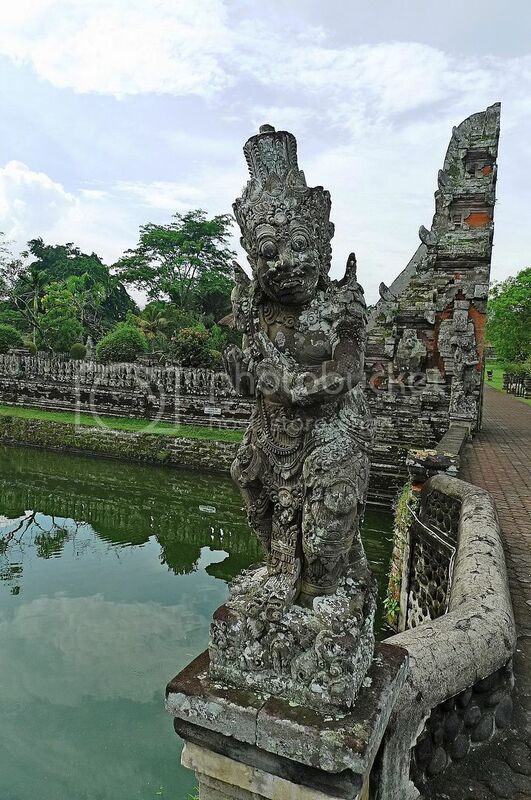 Hmmm...symbolizing 9 main gods of Balinese Hinduism? :p Wow...you really did your homework huh! Those were called merus? :p Amazing...they are so gorgeous. I wanna be there too. There are 11 tiers right? :D Ouh....they are even a lotus river beside those merus structure? yeah nice merus!! i wanna go back to bali again!! wow look so historic foong! how are you now foong? Nice view,merus are gorgeous too. 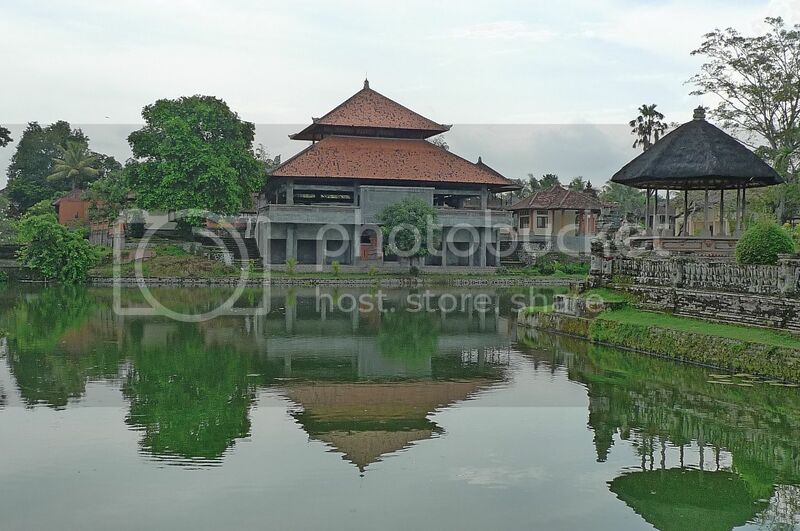 The main gate of the temple is very well designed.The temple was surrounded by ponds.Great shots foong.TK ,Happy weekend. Oh my the entrance so nice! And did you have to wear sarong to go in? Last time when we went to Bali's temple, we had to wear sarong! 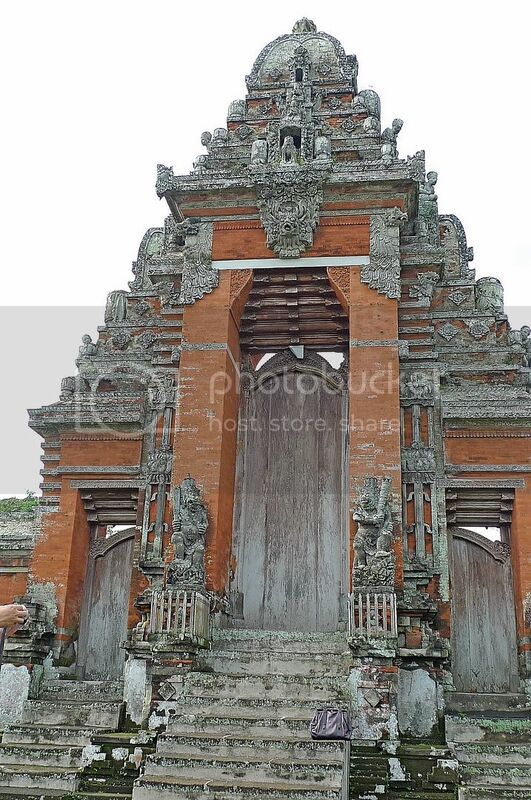 yeah, did you noticed all the entrance in Bali are similar, with such architecture?? stone-carved statue on each side.. very unique..
i think the merus are just magnificent!! 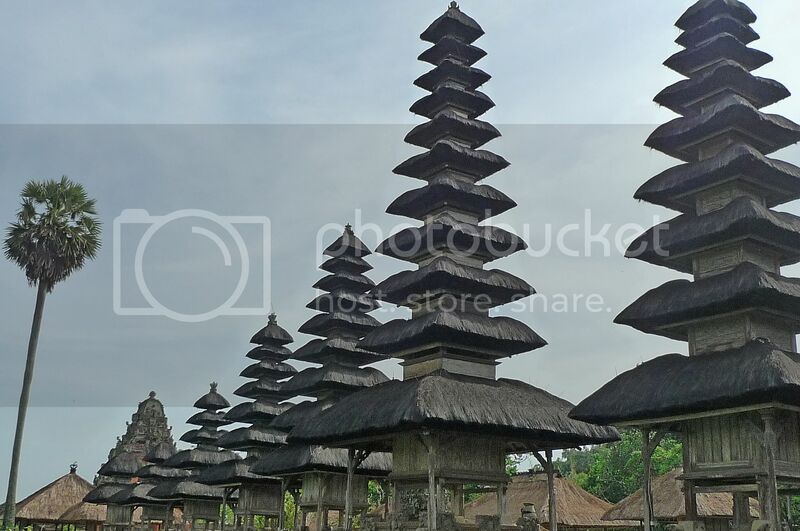 quite similar to the chinese pagodas.. but a few of them together really look grand and astonishing..
hehehe, the coconut looks nice!! it was sure a great quencher and cooler under such hot weather..
What a coincidence just saw a photo of the Leaning Tower of Teluk Intan and it has 8 tiers..
Wow love this place! 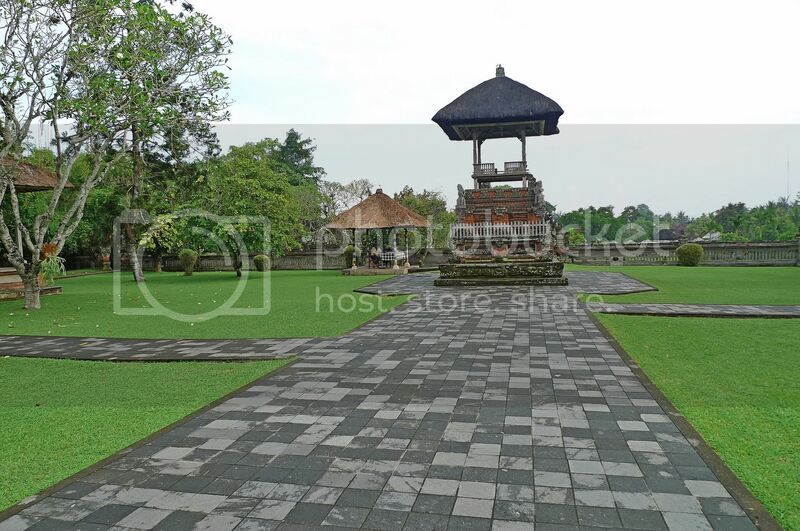 I must visit this park/temple when I go to Bali. Btw how's the weather there? that looks like a nice place to visit. glad you had a blast. Awesome post. 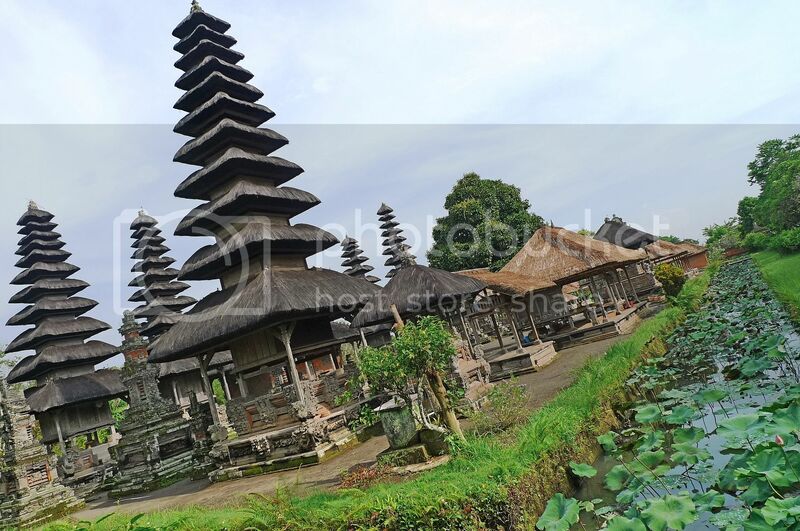 The landscape surrounding the temple is very beautiful.The tiered roofs of the temple is so beautiful. It is indeed one of the finest post by you. 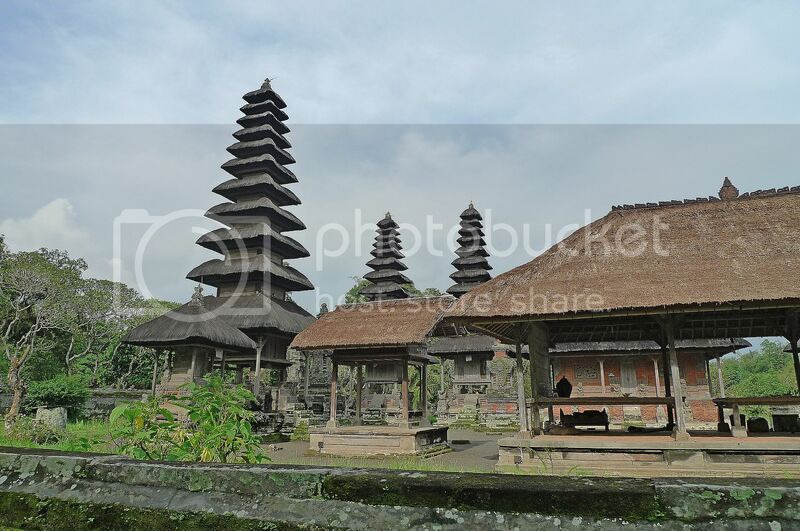 The pictures are really amazing and more amazing were Pura Taman Ayun. If I have not came across this blog, then I would have missed it. Thanks for sharing the blog. Hope you had a great time there. bananaz, we wee not allowed to access the merus. Only could watch from outside the walls. Haha! The cocnut was huge but not as huge as a basketball! LOL! merryn, what to do? You have to wake up earlier to be FC here! Haha! cheahs@n, haha! Klang's Meru is of a different kind! tekkaus, Chinese temple with Islamic influence? Actually it's a Hindu temple. Yes, I also find the gate like structure unique and interesting. 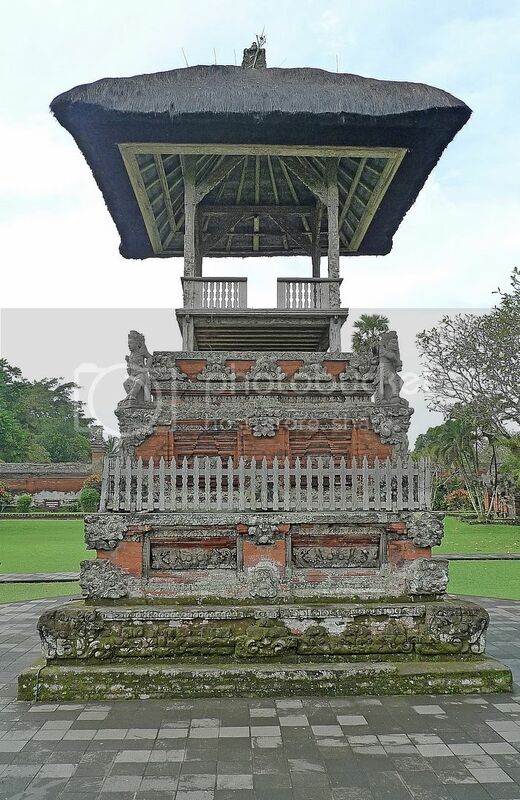 You can find this structure in many places in Bali. The entrance fee was cheap indeed. SK, well you can always go Bali again! Haha! Yes, all the entrances had similar architecture - they were nice! Yes, love the merus and indeed they looked similar to Chinese pagodas! bananaz, haha, The Leaning Tower of Teluk Intan does have 8 tiers, LOL! che-cheh, yes you must visit it! But the weather was very hot!! What time were you there? How come there's no other tourists or visitors around? So conducive for a relaxing holiday. I don't mind living here. Those merus are magnificent! Temple architecture always fascinates me. 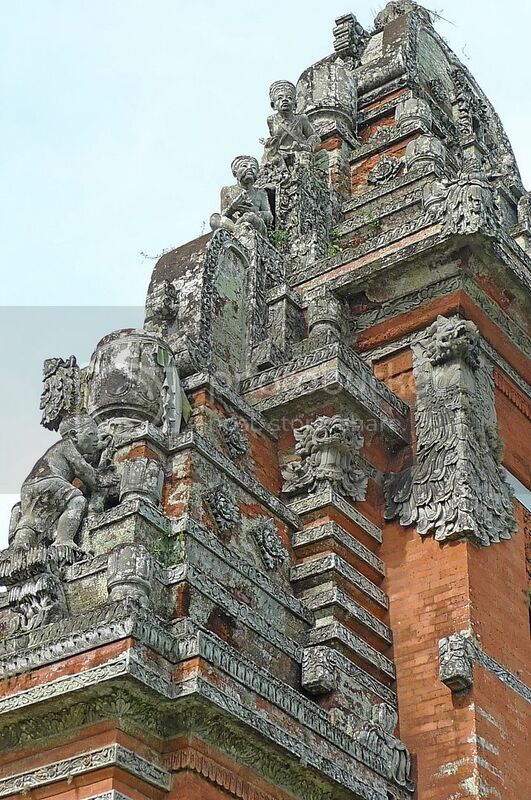 I am now looking forward to our Siem Reap trip in August! This blog Is very informative, I am really pleased to post my comment on this blog. It helped me with ocean of knowledge so I really belive you will do much better in the future. Good job web master. Why I Must Visit Tanah Lot Again!